I couldn't believe the phone call I received from NSTA on Friday September 9, 2011 around 4:30. 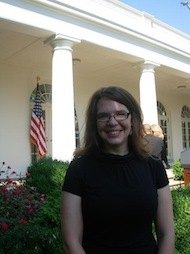 I was asked if I wanted to attend an event at the White House because I am a teacher affected by budget cuts! Then I was asked if I have ever met a president, because he would be there too. The woman at NSTA didnt have too many details about the event so I wasnt sure what I was attending. I needed to then contact the US Department of Education to arrange airfare and hotel. I also needed to send them a brief bio and security information. I booked a flight that was arriving in Washington, DC early in the day on Sunday, September 11, 2011 so I could sight see, since I had never been there. I spent that day walking around, exploring museums and memorials. I visited a very emotional September 11 exhibit at the National Museum of American History. Over the weekend I received confirmation from the White House that I would be attending an American Jobs Act event in the Rose Garden with the President. Monday, September 12, 2011 I walked to the White House and waited outside with a number of other teachers, principals, small business owners, firemen, police men and women, and veterans. While waiting in line to go through security, I learned I would be standing behind the President on the steps of the Rose Garden while he gave his remarks! There were about 30 of us in a separate room while the other guests were guided to their seats. We did a brief rehearsal/walk through of where we were going to stand and how we were to walk to our spots once the time came. Our group was then led to the Roosevelt Room to wait for our meeting with the President. Not only did we meet President Obama, but Vice President Biden as well! After our introductions, we walked out to the steps of the Rose Garden. What a strange feeling seeing TV cameras and a crowd of people taking pictures! The President came out and gave his remarks about sending the American Jobs Act to Congress. Afterward, a few more pictures were taken and we left. I spent the rest of that day in the National Museum of National History before heading home. Having family and friends tell me they saw me on TV and then seeing myself on TV and in pictures of the event was exciting! What an experience!! Copyright © 2011 by Lorentyna Baldus.